These Fish are very numerous in the Shallows near the low and flat Parts of the Bahama Islands, they are carried through small Channels a little Way within Land, where vast Quantities of them are taken at the ebbing of the Tide, by the Inhabitants stopping up the Channels they came in at; They are small silver-scaled Fish, resembling somewhat a Herring, but smaller and tolerable good Food. 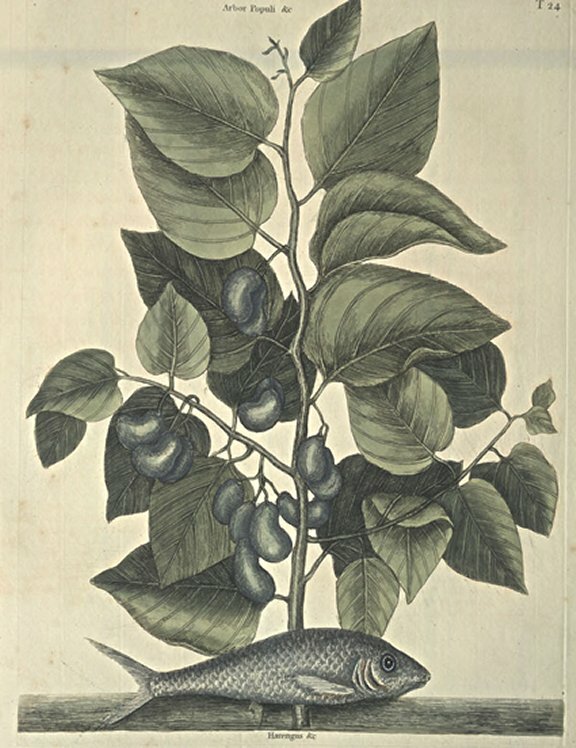 This large Shrub or small Tree, was of the Height of about twelve Feet with Leaves, resembling those of the black Popler, set alternatly, The Fruit are somewhat of the Form of a Kidney, tho' more resembling the Nut or Seed of the Accajou, but not so big; The Fruit, though not mature, seemed to be at full Bigness and was single dividing in the middle like a Bean, and that enclosed in a Film or thin Skin, three or four hanging in a Cluster on Footstalks about an Inch long. The Flowers I never saw: It grows near the Sea.